Apex Shark Expeditions morning shark tours offers guests a chance to observe natural predation, breaching and experience shark cage diving - all on one trip. We take small groups of no more than 12 guests, allowing each guest excellent viewing opportunities as we share our knowledge and passion for these creatures. Guests can book a day trip or a longer more specialised expedition. 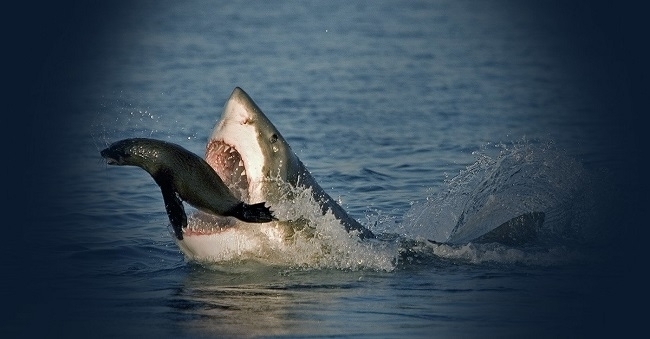 May to Sep: Breaching, natural predation and shark cage diving. 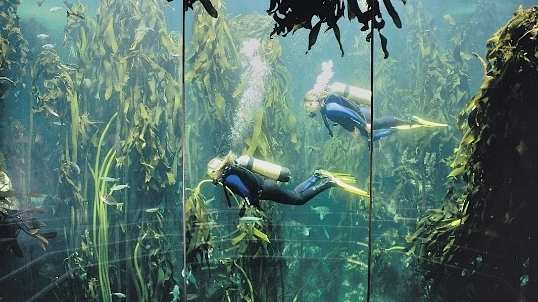 5 divers – No experience required. 20 – 30 minutes cage time. Coffee / tea, light breakfast, passionate crew, educational booklet, dive gear, light lunch, snacks & refreshments. 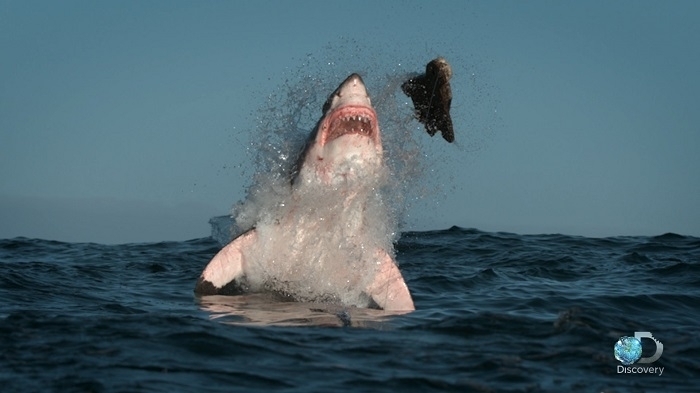 Although this is not peak season for seeing natural predatory events and breaches, Great White Sharks are actively scavenging on sick or dead seals that wash off Seal Island and there is a good chance of observing natural scavenge events. Meet the crew at the Apex Shark Expeditions shop. After a light breakfast, guests are welcomed aboard White Pointer II. A full safety and weather briefing is given before departure. 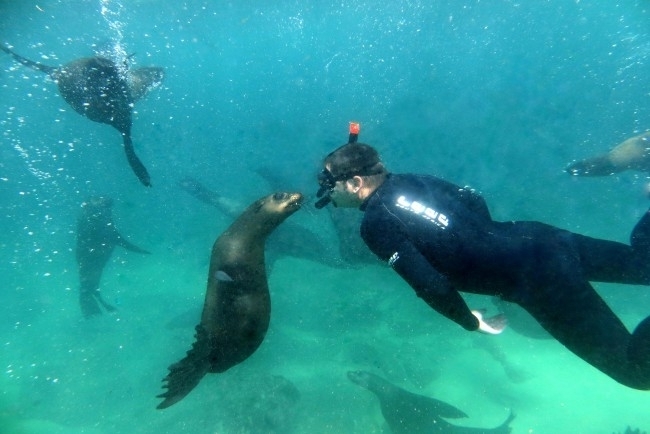 Depart for Seal Island which is a 25 to 35 minute boat ride based on sea conditions. Arrive at Seal Island. Based on what the weather is doing, we will decide on the best spot to weigh anchor and begin attracting sharks to the vessel. The cage is then deployed, where it floats next to our vessel. Once a shark approaches our boat, a bait is kept in the water to keep the shark around long enough for identification, viewing and shark cage diving purposes. At no point are the sharks purposefully fed or handled and all efforts are made to prevent the sharks from making contact with our vessel. If the weather conditions are favourable, guests will be readied for shark cage diving. Safety precautions and operational procedures are then explained to any guest wishing to enter the cage. It is important to know that the sharks come very close to the boat so it is not necessary to dive in order to see them. 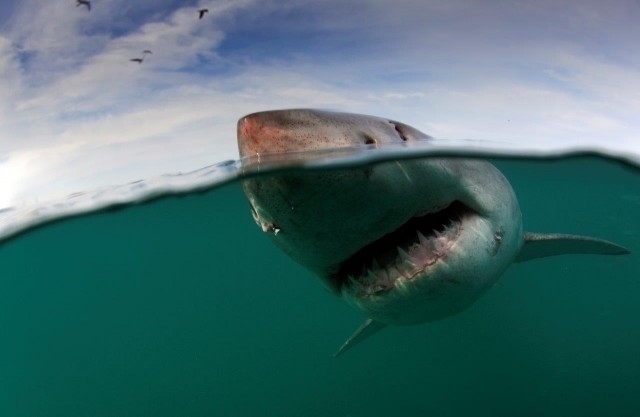 Those not wishing to dive will have excellent views of the Great White Shark. 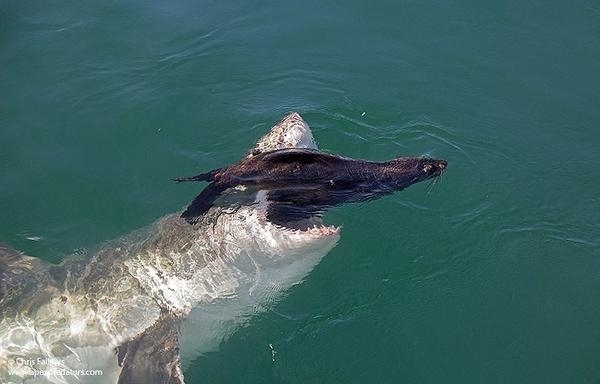 As winter begins and the seal colony blossoms, the sharks begin to change their behaviour and begin actively hunting Cape Fur seal pups. These months are best to view natural predation events and breaching. A light lunch of rolls with cold meats (or a vegetarian option), accompanied by soft drinks, fruit juice, bottled water and a variety of snacks are available throughout the course of the morning. Coffee / tea, passionate crew, educational booklet, dive gear, light meal, snacks & refreshments. Grosvenor Guest House or the Quayside Hotel. Budget option: Simon’s Town Backpackers. Once you arrive in Cape Town, we take care of everything for you. Daily shark cage diving trip – either morning or afternoon or a combination thereof. Light breakfast at meeting point and light lunch and snacks on board on seagoing days. Accommodation in Simon’s Town at the Grosvenor Guest House or The Quayside Hotel. We do also offer a budget option at The Simon’s Town Backpackers. 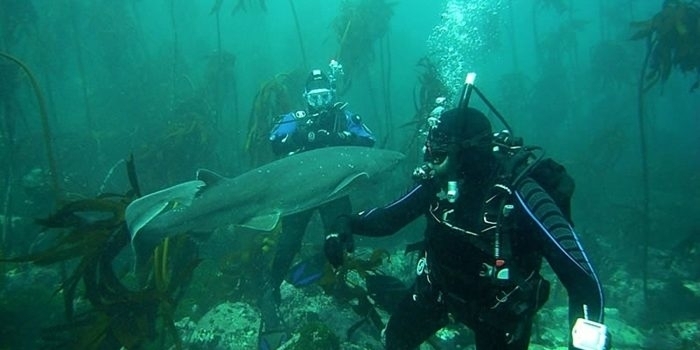 Gansbaai is located just 2 hours from Cape Town and Great White Shark cage diving trips are offered throughout the year. The waters off of Dyer Island in Gansbaai are aptly named Shark Alley and are known for their exceptional Great White Shark populations. 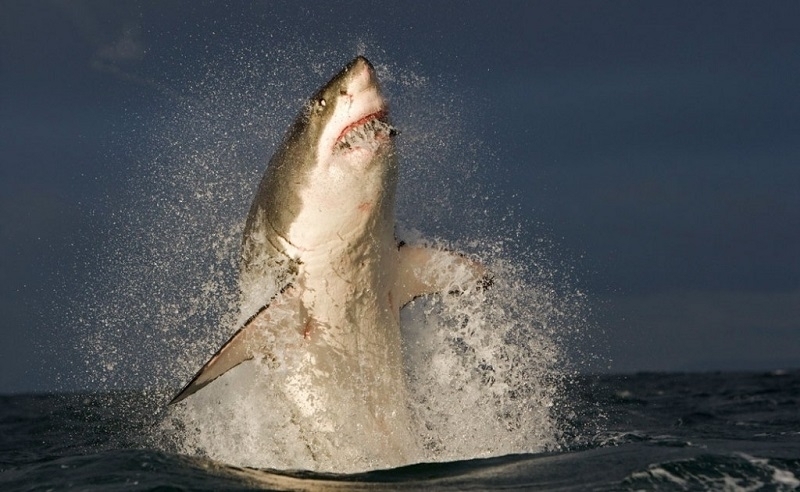 The sharks are attracted by the massive 60 000-strong Cape Fur Seal colony which inhabits the smaller island of Geyser Rock. Other wildlife species such as Cape Gannets, Cape Cormorants, African Penguins, whales and dolphins are also likely to be sighted. 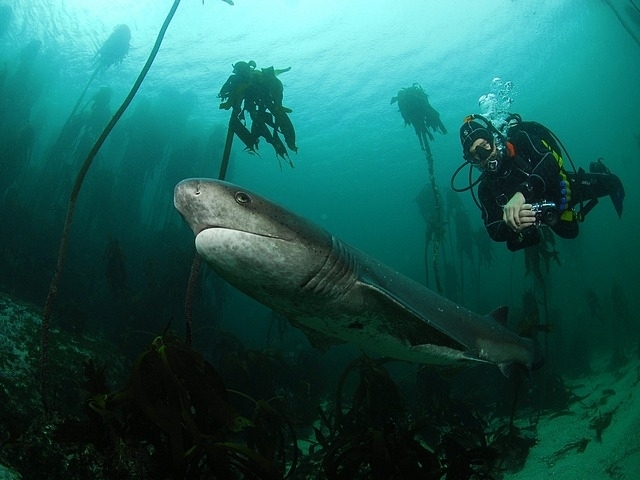 *Please note: It is best to book shark cage diving trips in False Bay during February to September. False Bay is out of season from October to January and we will assist you in booking a Gansbaai trip during these months. 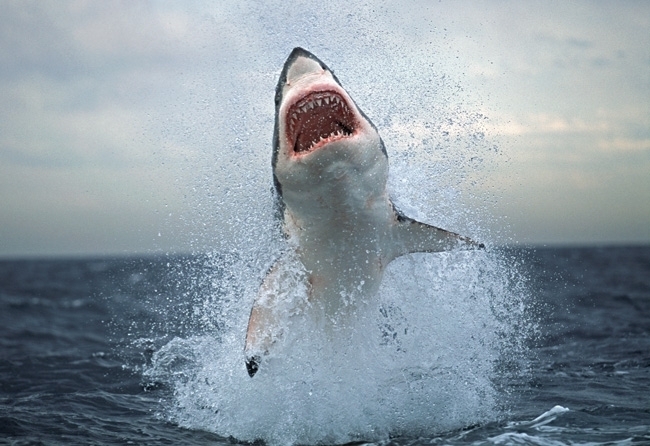 We book our guests on these great white tours with our sister operator at no extra cost. The Seven Gill Cow Shark, or Spotted Cow Shark, is a prehistoric predator and can be found roaming kelp forests. It is a social feeder and can be observed in large groups of up to 18 individuals. 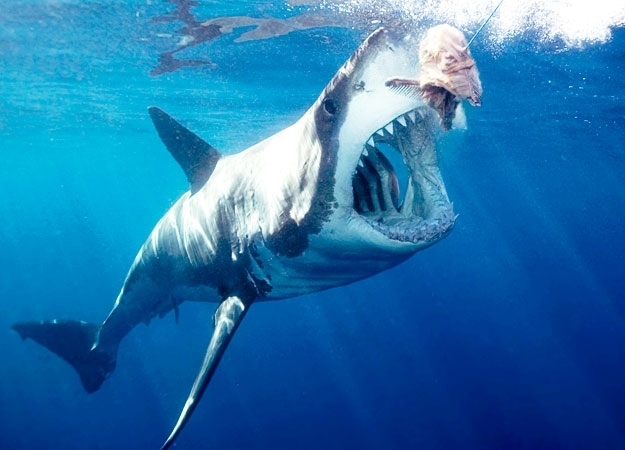 The size of the sharks ranges from 1 to 3 metres, with the females generally larger than the males. Distinctive features include their seven gill slits and the absence of the front dorsal fin. 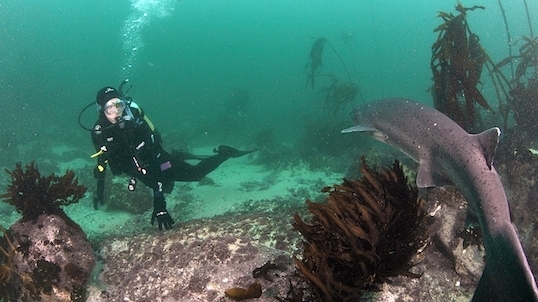 The dive takes place at Pyramid Rock in False Bay.The site is one of the few places in the world where you have a chance of encountering this rarely seen shark. We may encounter a variety of other small shark species as well. A thick kelp forest lines the channel making this the shark’s ideal habitat. The vessel you will be diving off is a zodiac rib boat, which is standard for South African diving operators. There are no facilities on board except for a small cubby hole for keys and sunglasses. We advise you to leave all your personal belongings behind. 6 to 12 metres (20 – 40 feet). 12 to 20 Degrees Celsius. Door to door transfers available upon request. As these dives are specialised, we partner with a certified operator. Exact itinerary timings will be confirmed the day before the trip. 45 minutes from Cape Town at the Apex Shark Expeditions shop or on the Simon’s Town pier. Here you will sign an indemnity form and collect your dive gear. Millers Point is a 15 minute boat ride from the Simon’s Town pier. The boat is a rubber duck with minimal facilities. The dive takes place in a channel approximately 12 metres deep. Divers descend to the sandy bottom and wait for the Cow Sharks. Should they appear, the sharks usually swim slowly up and down the channel. They are very confident and can pass at arm’s length from the divers which makes it a great opportunity for underwater photographers. 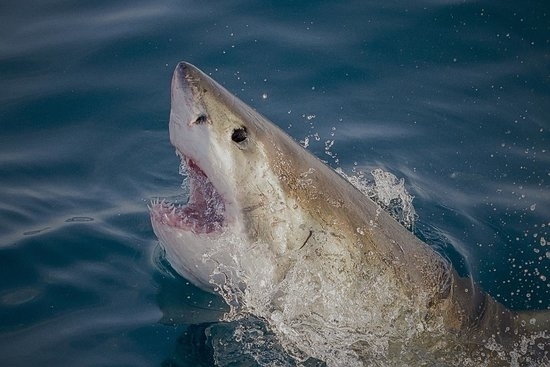 By the end of the dive you may recognise the individual sharks by distinctive bites, scrapes or coloration. All dives are weather permitting and subject to good sea conditions. 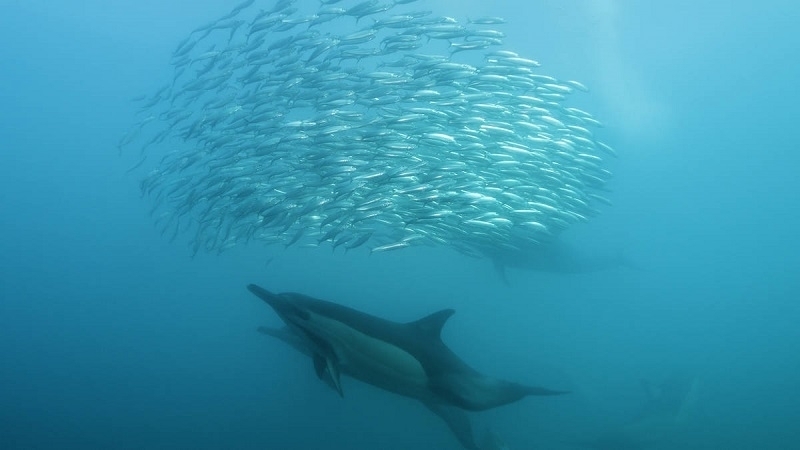 The oceans off the southern tip of Africa offer some of the most exciting whale watching in the world with at least 37 different species of dolphins and whales calling these waters home! 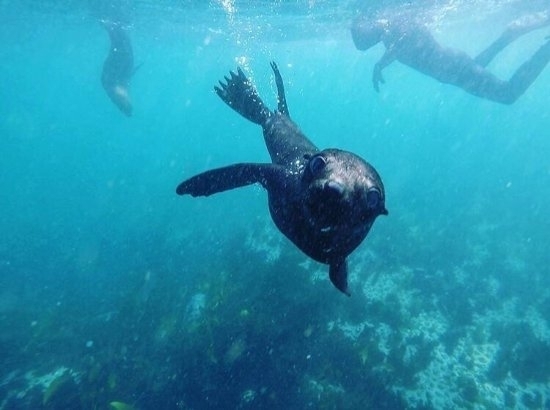 The whale watching trip gives you an opportunity to marvel at the size and grace of these incredible animals and be thrilled by encounters with a host of other marine life including African penguins, Cape Fur seals, Cormorants, Bank Cormorants and possibly even sharks. Meeting: Simon’s Town Pier, Wharf Road. 10H30 or 14H00 subject to tidal and weather conditions. Meeting: The Great White House, Kleinbaai. This will be confirmed with you the day before your trip as times vary with weather and tide conditions. 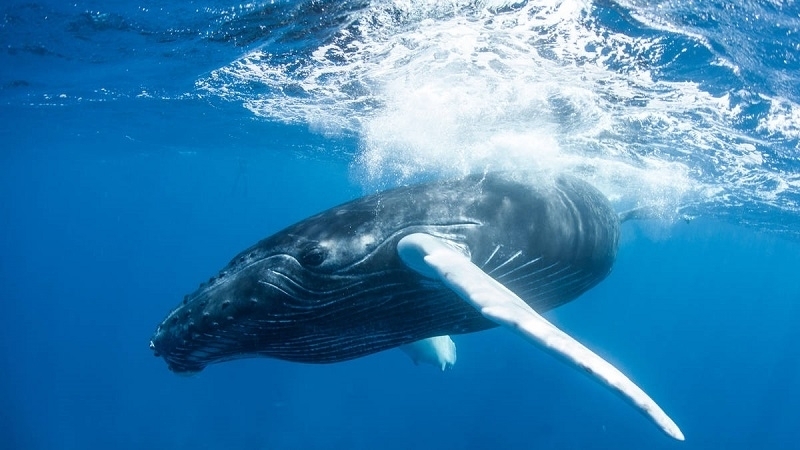 Places from which to observe these gentle giants include False Bay which offers whales a safe haven to frolic in these protected waters. It is estimated that there are between 3 000 – 4 000 Southern Right Whales left in the world’s oceans and South Africa is privileged to have a major percentage of them visit its coasts annually. This location offers two departures daily. Meeting is at Simon’s Town Pier, Wharf Road in Simon's Town. Gansbaai is a quaint fishing village and is popular among tourists. 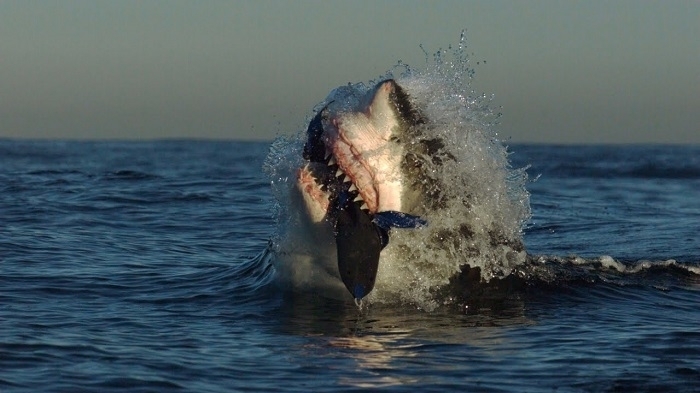 It is known for its populations of Great White Sharks and its superb whale watching conditions. 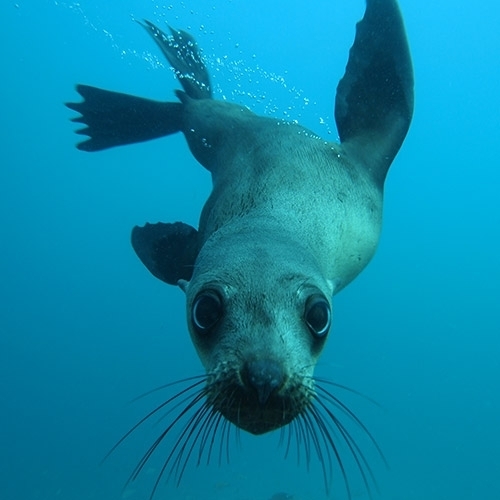 This trip is a marine seafari and there is the chance to see dolphins, penguins, seals and sharks. This location offers two departures daily. Meeting is at The Great White House, Kleinbaai in Gansbaai.